Well with the loss of pops, I have been pretty much a lump the last week. For this challenge I decided I wanted something bold, and with just a couple patterns. 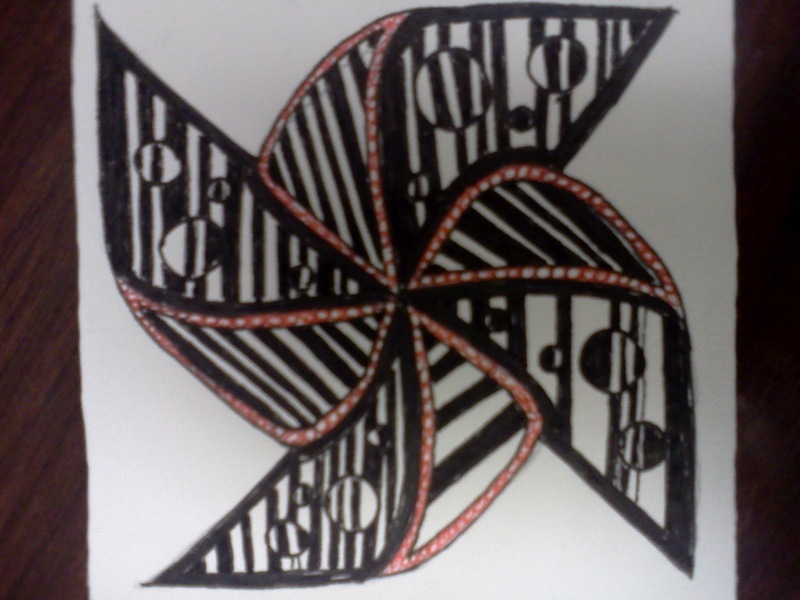 I know in Zentangle® there are no mistakes, but I made a couple here, and did not like this when I finished it, but as often happens it grew on me so here is my tile for the challenge this week. i like the addition of color - this was a fun one to do, wasn't it? I think it's nice with the red lines. This looks like one I would make mistakes with too if I did it ... I think it's a great result and like Alice I like the touch of color! I really like the contrasting colour on this one, makes the centre of the pinwheel stand out. Lovely. Bold you got - it's fabulous! I like the dark bold look!!! Cool. I love the boldness and you are right that it has no mistakes.....just a wonderful statement of beauty! Roy, this is beautiful, and I agree with ledenzer: it's very bold. I like it!